It’s that time of year–football season has started, my friends! Woo hoo! This is also that time of year where I pretend to be super excited about football season starting. Let me explain myself. I am excited about football season, but not necessarily for the actual football game, but for the frenetic energy and social gatherings that are associated with football season! Food, drinks, friends, and football. Notice how football is last. 🙂 I also should probably bump up friends before food and drinks, but eh, that’s just a technicality. To be completely honest, I really didn’t even learn the rules of football until I arrived at college! My family was never a big sports family and I never had a big brother to sit there and explain it to me. I’m also assuming this imaginary big brother actually would sit down and explain it to me…in a perfect world. I have to come to enjoy and understand football and will cheer fiercely for my team (Go NOLES!) but that exhilarating feeling I have on game day stems mostly from the fact that I know I’m going to hang out with friends, BBQ, drink beer, wear fake tattoos of my school’s logo on my face, and show off my newest game day apparel. Yes, I’m a girl. We get excited about game day outfits. Deal with it, guys. I love the sense of camaraderie that accompanies football season. At games, people you don’t even know are throwing you high fives, everyone is jumping up and screaming in exaltation when their team scores a touchdown or conversely in exasperation when the ref makes a call in favor of the other team, sitting on a crammed couch at a friend’s house with people you might not even know that well–all fixated on the big screen TV, and for a mere few hours the stresses of everyday life are replaced with how many points your wide receiver put up in fantasy football or if the beer stash is running low. Accompanying football season is an assorted variety of certifiable artery clogging junk foods. Burgers, buffalo wings, cheese fries, hot dogs, the list goes on. They are delicious. I love them all. I’m currently drooling on my computer thinking about them. However, being vegetarian during football season makes it impossible to eat many of these foods! Hmph! 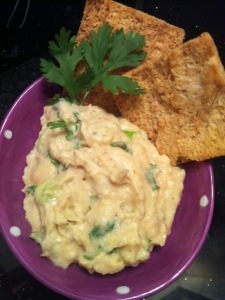 This white bean dip is a simple recipe, is low fat, and is always a big hit for guests whenever I make it. It deviates from the uninspired chips and salsa or queso dip that always make an appearance at get togethers. Try this instead! Your mouth will be happy, your waistline will thank you, and your friends will be impressed! Sounds like a no brainer to me! In a food processor, puree the beans, garlic, lemon juice, and ground coriander. Transfer to a bowl and mix in the remaining ingredients (scallions, olive oil, cilantro, pistachios, salt/pepper). Taste it (duhh) and see what you need more of. If it’s too dry and thick add some more olive oil and lemon juice.